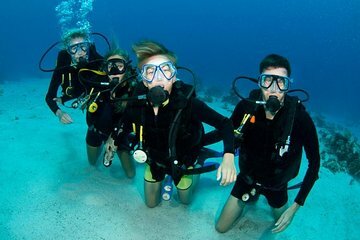 Discover the vast waters off St Maarten on a certified scuba diving excursion. Set out on a short cruise from Philipsburg and plunge into the sea alongside experienced PADI guides, who will bring you to the area's best dive sites for the weather—taking into about your diving preferences and group members' various skill levels. Explore the colorful corals of Mike's Maze, peruse the remains of sunken sailboats and an old bridge, or marvel at eagle rays as they glide gracefully above you.